Background: Diabetic retinopathy is a retinal vascular disorder that affects more than 4.1 million people in the United States. New methods of detecting and ensuring adequate follow-up of this life-altering disease are vital to improving patient outcomes. Wills Eye Hospital and the Centers for Disease Control and Prevention are conducting a collaborative study to initiate a novel diabetic retinopathy screening in the community setting. Objective: To evaluate the feasibility of a more widespread, large-scale implementation of this novel model of care for diabetic retinopathy screening in the community setting. Methods: A simple, self-administered survey was distributed to pharmacists, pharmacy technicians, student pharmacists, and Wills Eye Hospital interns. The survey consisted of open-ended questions and responders were given 1 week to respond. A total of 22 surveys were distributed and 16 were completed. The responses were culled and analyzed to assess the feasibility of implementing this novel screening model in the pharmacy. Results: The response rate to this pilot survey was 72%. The majority of the responding pharmacy staff members indicated that diabetic retinopathy screening in community pharmacies would greatly benefit patients and could improve patient care. However, they also noted barriers to implementing the screening, such as concerns about the cost of carrying out the screenings, the cost of the equipment needed to be purchased, and the lack of time and shortage of pharmacy staff. Conclusion: The potential exists for pharmacists to positively influence diabetes care by implementing retinopathy care through the early detection of the disease and reinforcement of the need for follow-up; however, real-world barriers must be addressed before widespread adoption of such a novel model of care becomes feasible. Ms Law and Ms Komura are PharmD candidates, Jefferson School of Pharmacy, Thomas Jefferson University, Philadelphia, PA; Dr Murchison is Codirector, Emergency Department, and Associate Professor of Ophthalmology, Wills Eye Hospital, Philadelphia, PA; Dr Pizzi is Associate Professor, Department of Pharmacy Practice, Jefferson School of Pharmacy, Thomas Jefferson University. The Table summarizes the findings of these previously published pharmacist community screening programs for a variety of disease states, including osteoporosis, cardiovascular disease, peripheral arterial disease, and chlamydia. The successful outcomes of these studies provide insight into the feasibility of implementing diabetic retinopathy screenings in community pharmacies, showing that quick interventions, such as friendly reminders and on-the-spot counseling, are effective ways to motivate patients to improve their health. Diabetic Retinopathy Community Pharmacy Study The Wills Eye Institute Department of Research and the Centers for Disease Control and Prevention (CDC) are completing a collaborative study to test diabetic retinopathy screenings in a community pharmacy setting. The screening is performed using the Nidek fundus camera, which has a market price of $26,000 and can be completed in approximately 15 minutes. Patients do not require chemical dilation, and the process is painless. Although the Nidek fundus camera is not the gold standard for screening for diabetic retinopathy, it is an emerging practice that shows promise in identifying eye abnormalities. Of the patients screened at Wills Eye Hospital, 10% showed signs of diabetic retinopathy and 49% showed signs of other eye abnormalities, such as cataracts and hypertensive changes. Despite these promising findings, the technology can only be successfully integrated into pharmacy settings if staff members are trained and have the necessary time and tools to conduct the screenings. Pharmacies are often very busy, and additional staff may be required to operate the camera and spend time screening patients. To explore these issues, we created and conducted a brief open-ended pharmacy staff survey assessing the potential benefits and barriers of such screening. This pilot survey was an unfunded research exercise conducted outside of the formal CDC parent project. Surveys were self-administered on paper by 5 pharmacists, 3 pharmacy technicians, 3 pharmacy students, and 5 research interns who were working at or who were connected to the pharmacy that participated in the diabetic retinopathy screening study. Research interns were actively running the eye screenings, while the pharmacists and pharmacy technicians referred patients with diabetes to the beneficial free screening. Each respondent was given 1 week to answer the survey, and responses were collected in person at the end of the 1-week time frame. The total study sample included 16 respondents (Figure 1) of a total of 22 surveys distributed, resulting in a 72% response rate. The survey consisted of 7 open-ended questions regarding the benefits of the eye screening, possible barriers to widespread implementation (Figure 2), and personal opinions of the screening (see the Appendix here). Because this was a pilot survey of attitudes and beliefs of the pharmacy staff, approval by an Institutional Review Board was not required. The responses to the survey by the pharmacy professionals revealed several potential benefits for the diabetic retinopathy screenings when done by pharmacists. First, pharmacists are convenient and accessible healthcare providers who are trained to counsel patients to improve healthy behaviors. Second, pharmacists can readily identify patients with diabetes for screening based on their medication histories. Third, placing this technology at the hands of community pharmacists enables the detection not only of diabetic retinopathy but of other eye abnormalities that may remain otherwise undiagnosed. Furthermore, patients may feel comfortable approaching pharmacists, because doing so is free and does not require an appointment. However, the survey findings also suggested a number of barriers to implementing diabetic retinopathy screening in community pharmacy settings. For example, in high-volume pharmacies, respondents indicated that there would not be enough time to run diabetic retinopathy screenings in addition to completing their daily responsibilities. To do so, they would need an additional staff dedicated to run the screenings to prevent the process from interfering with the daily workflow. Another barrier relates to the cost of the Nidek fundus camera screening device. The expense associated with the purchase of this technology would only be justified if the volume of patients screened at each pharmacy resulted in reimbursements sufficient to recoup its cost. Currently, the diabetic nephropathy screening is being provided at no charge; however, the respondents noted that large-scale, sustainable implementation would require pharmacies to charge for this screening to make it financially feasible. The responses to our pilot survey showed that diabetic retinopathy screenings by community pharmacies are beneficial to patients, although real-world implementation barriers exist. Pharmacists are in a unique position to identify diabetic retinopathy screening candidates based on their medication histories and can utilize the screenings as a vehicle for promoting patients to seek diabetic retinopathy care from their physicians. How­ever, the time and resources required to implement the screenings must be addressed. If implemented, diabetic retinopathy community pharmacy screenings have the potential to reduce the burden of diabetic retinopathy at the population level and to also positively impact the care of individual patients through detection and reinforcement of the need for follow-up. Ms Law, Ms Komura, Dr Murchison, and Dr Pizzi reported no conflicts of interest. Fraser CE, D’Amico DJ. Classification and clinical features of diabetic retinopathy. UpToDate. www.uptodate.com/contents/classification-and-clinical-features-of-diabetic-retinopathy. Accessed March 4, 2012. Congdon N, O’Colmain B, Klaver CC, et al; for the Eye Diseases Prevalence Research Group. Causes and prevalence of visual impairment among adults in the United States. Arch Ophthalmol. 2004;122:477-485. National Eye Institute. Facts about diabetic retinopathy. Updated June 2012. www.nei.nih.gov/health/diabetic/retinopathy.asp. Accessed November 13, 2013. Lee PP, Feldman ZW, Ostermann J, et al. Longitudinal prevalence of major eye diseases. Arch Ophthalmol. 2003;121:1303-1310. Kempen JH, O’Colmain BJ, Leske MC, et al; for the Eye Diseases Prevalence Research Group. The prevalence of diabetic retinopathy among adults in the United States. Arch Ophthalmol. 2004;122:552-563. The Foundation of the American Academy of Ophthalmology. Diabetic retinopathy summary benchmark—November 2008. www.aaofoundation.org/hoskins/QEC-Content-Display.cfm?fuseaction=display&link=ea5c6d25-2ab9-4398-b00b8efcb8cc5bc7§ion=SummaryBenchmarks. Accessed October 17, 2013. American Diabetes Association. Diabetic retinopathy. Diabetes Care. 2000;23 (suppl 1):S73-S76. Schoenfeld ER, Greene JM, Wu SY, Leske MC. Patterns of adherence to diabetes vision care guidelines: baseline findings from the Diabetic Retinopathy Awareness Program. Ophthalmology. 2001;108:563-571. Zhang X, Saaddine JB, Lee PP, et al. Eye care in the United States: do we deliver to high-risk people who can benefit most from it? Arch Ophthalmol. 2007;125:411-418. Klein R, Klein BE, Moss SE. Epidemiology of proliferative diabetic retinopathy. Diabetes Care. 1992;15:1875-1891. Thomas G, Humphris G, Ozakinci G, et al. A qualitative study of pharmacists’ views on offering chlamydia screening to women requesting Emergency Hormonal Contraception. BJOG. 2010;117:109-113. Snella KA, Canales AE, Irons BK, et al. Pharmacy- and community-based screenings for diabetes and cardiovascular conditions in high-risk individuals. J Am Pharm Assoc (2003). 2006;46:370-377. Erratum in: J Am Pharm Assoc (Wash DC). 2006;46:666-667. Winfrey C, Wortman S, Frede S, et al. Pharmacist-initiated peripheral arterial disease screening program in a community pharmacy setting. J Am Pharm Assoc (2003). 2011;51:373-377. Fuller L, Conrad WF, Heaton PC, et al. Pharmacist-managed chronic obstructive pulmonary disease screening in a community setting. J Am Pharm Assoc (2003). 2012; 52:e59-e66. Peterson GM, Fitzmaurice KD, Kruup H, et al. Cardiovascular risk screening program in Australian community pharmacies. Pharm World Sci. 2010;32:373-380. Yuksel N, Majumdar SR, Biggs C, Tsuyuki RT. Community pharmacist-initiated screening program for osteoporosis: randomized controlled trial. Osteoporos Int. 2010; 21:391-398. Johnson JF, Koenigsfeld C, Hughell L, et al. Bone health screening, education, and referral project in northwest Iowa: creating a model for community pharmacies. J Am Pharm Assoc (2003). 2008;48:379-387. One major complication of diabetes is diabetic retinopathy, a leading cause of visual impairment and blindness. As Law and colleagues point out in the current article, diabetic retinopathy affects more than 4.1 million patients in the United States, yet only approximately 50% to 60% of these patients follow the recommendation for an annual fundus examination. An even smaller number of patients with diabetes have proper screening for diabetic retinopathy. With a relative shortage of primary care physicians, and larger insured populations on the horizon with the implementation of the Affordable Care Act, one can speculate that these statistics may not improve without innovative approaches to screening. PHARMACISTS/PROVIDERS: As is the case for many common chronic diseases, we can do a far better job of screening for this severely debilitating illness. In this article, the authors consider the possibility of screening for diabetic retinopathy at the community pharmacy. This is an interesting concept that bears further exploration before implementation. 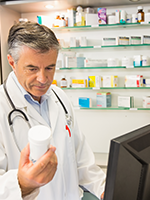 We know that one of the most frequently used sites of service for most patients is the pharmacy. Patients with diabetes who present to the pharmacy can readily be identified by their medication profiles, and it would be relatively easy to ask them at the time of encounter about the timing of their last eye examination. However, practical considerations (many of which are mentioned in the article) must be considered before moving forward with such screenings in the pharmacy. Such things as equipment cost, training, and even time needed to do the examination properly are significant considerations that need further exploration. How the results are interpreted and how continuity of care is ensured are also concerns when one entertains wide-scale screening in novel sites of care. In addition, we must consider whether patients would be willing to take the time to have the examination done during a pharmacy visit. These issues bear further exploration before considering implementation of this approach to diabetic retinopathy screening. What struck me as most intriguing in this article is that the authors were willing to explore the use of pharmacy resources to positively impact the care of a large and growing population of patients with a chronic illness. This potential approach to the management of a chronic illness and others like it must be considered if we are to improve access and outcomes of care in the future. Further investigation of nontraditional sites of care and perhaps integrating traditional services in alternate locations should be encouraged in the future. US Department of Health and Human Services; National Diabetes Information Clearing House. National Diabetes Statistics, 2011. http://diabetes.niddk.nih.gov/dm/pubs/statistics/#fast. Accessed December 8, 2013. Boyle JP, Honeycutt AA, Narayan KM, et al. Projection of diabetes burden through 2050: impact of changing demography and disease prevalence in the US. Diabetes Care. 2001;24:1936-1940. Centers for Disease Control and Prevention. Number of Americans with diabetes projected to double or triple by 2050. www.cdc.gov/media/pressrel/2010/r101022.html. Accessed December 9, 2013.